Optimum health for your dog starts with complete nutrition. This veterinarian-formulated dog multivitamin contains over 21 vitamins, minerals, antioxidants, amino acids, and essential fatty acids to help keep your best furry friend healthy and in peak physical condition. Even the healthiest diets can lack vital nutrients and lead to deficiencies.This comprehensive canine multivitamin – for dogs and puppies alike – is the perfect daily complement to commercially prepared dog foods, as well as homemade and raw food based diets, all of which can lack essential nutrients. Essential nutrition is packed into a soft and delicious chew, and dosing is easily tailored to to your dog’s size and needs. Antioxidants: A, C,E and selenium to fight free radicals and support immunity. B Vitamin complex: a full range of B vitamins for supporting a healthy mood, memory and metabolism. Essential fatty acids: EPA and DHA (fish oil) for shiny and healthy skin and coat, as well as healthy brain function. Essential minerals: a balanced formulation of minerals to support healthy blood cells, bones, and nerve function. 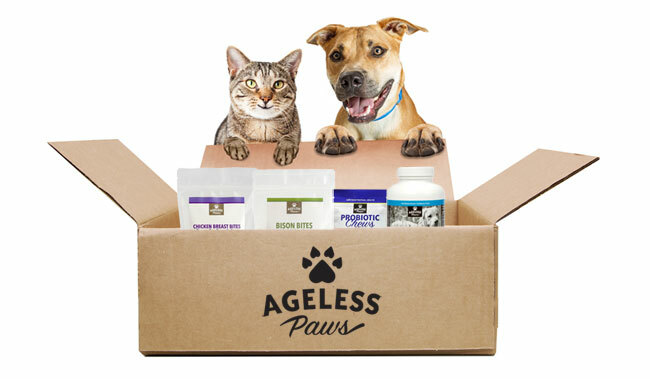 Why Ageless Paws puppy and dog vitamins? As a cardiologist, certified nutrition and anti-aging specialist, Dr. Sinatra has over 25 years of experience formulating nutritional supplements for humans, including antioxidant multi-vitamin and mineral supplements, and has searched extensively for the best puppy and dog vitamins and supplements. As a dog lover, he truly understand the importance of complete nutrition for our beloved canine companions. Through his research, Dr. Sinatra hand-selected this veterinarian-formulated multivitamin for dogs because it contains a spectrum of nutritional ingredients that support healthy metabolism and energy levels in dogs.